Experience the sights and sounds that Joseph and Mary may have experienced as they journeyed to Bethlehem. Some of the activities of the journey include registering for taxation, just as Mary and Joseph did, and experiencing the Bethlehem marketplace. Participants will also meet biblical characters and share a fireside with shepherds and their flocks. The journey ends with a live Nativity scene. Stops may be visited in any order. Both walking and driving is required. Admission is free and no pre-registration is required. Hours each day are 4pm to 8pm. 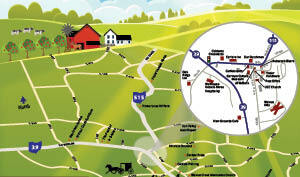 The first stop on the Journey is Walnut Creek Mennonite Church at 2619 County Road 144, Sugarcreek, OH, 44681. Stop here first to register and receive a map of the other stops. You may park at the church and ride the shuttle vans to the events in town. For more information, please call 330-893-4200. Admission is free. Note: this has become a popular event over the years! Often, the crowds began showing up before 4pm. We estimate over 6000 people participated in the Journey tour in 2018, despite the poor weather. Be sure to bundle up and be prepared for chilly weather.